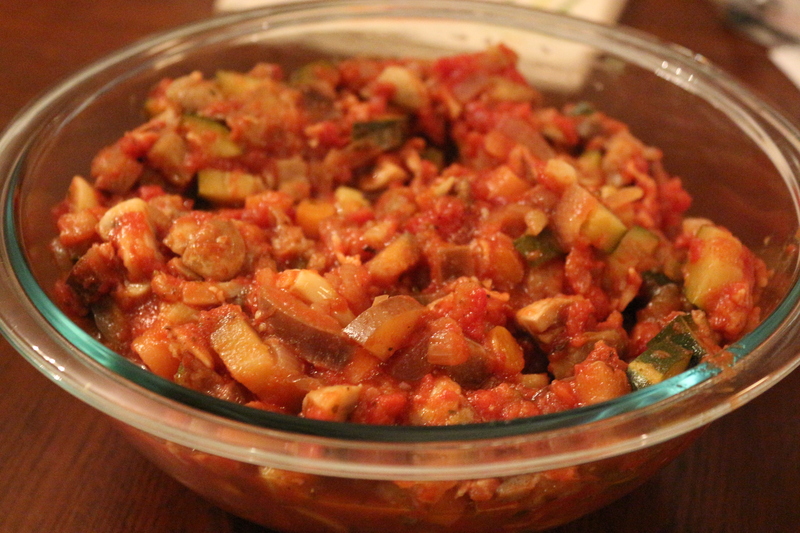 Ratatouille is one my favorite go-to, healthy, full-of-veggies and tasty dishes. It’s great because you can kind of throw in whatever veggies you have at the time, and also whatever type of canned tomatoes. Sometimes I use carrots, sometimes I use squash. Although I would say the basics needed are eggplant, zucchini, garlic and onion. This dish is easy to make and delicious to eat. I especially like it over brown rice, or like a thick stew. 1. Heat two tablespoons oil in a deep pot. Add the diced onion and spices (basil, oregano, salt, and pepper) and saute over medium-high heat until it begins to turn translucent. 2. 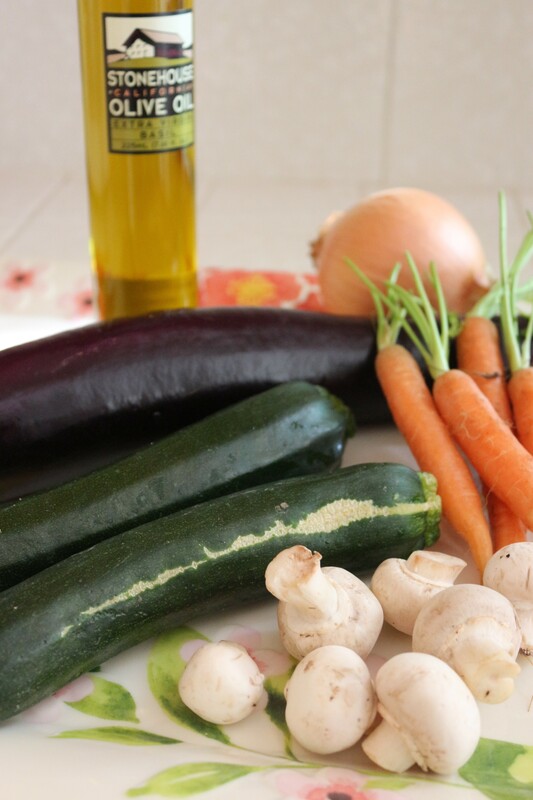 Add the garlic, eggplant, and two more tablespoons oil. 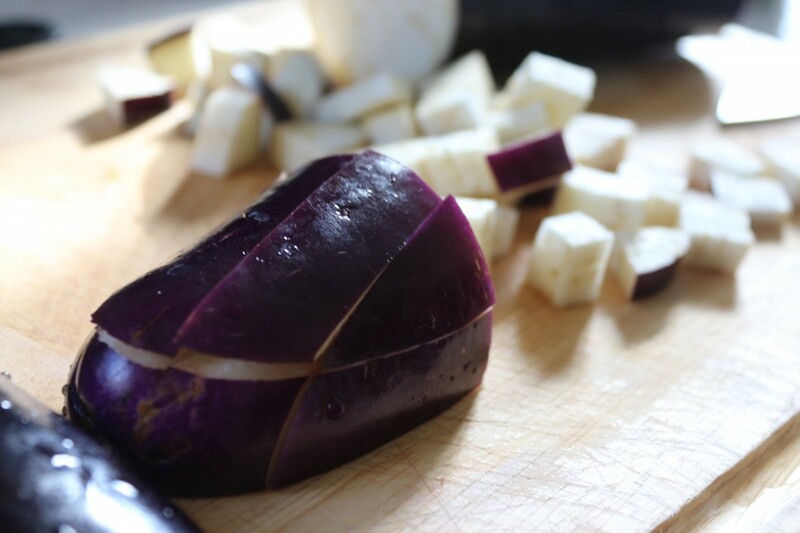 Continue to cook until the eggplant begins to soften, about 5 minutes. 3. Add the zucchini and the rest of the olive oil. Continue to cook for several more minutes. 4. Add the mushrooms and carrots and continue to cook for about 5-10 more minutes. 5. Add the wine. Allow the alcohol to steam off, about 2 minutes. Then add the tomatoes. 6. Turn the heat down and allow the entire mixture to simmer, about 25-40 minutes. Check to see if carrots have lost their crunch. If not, cook a little longer. 7. When the mixture is done cooking, stir in the parmesan cheese. Either serve right away or store in the fridge for a yummy meal later. This entry was posted in Breakfast, Mains, Sides, Soups and tagged Carrots, Eggplant, Gluten Free, Italian Foods, Squash, Vegetarian, Zucchini. Bookmark the permalink.